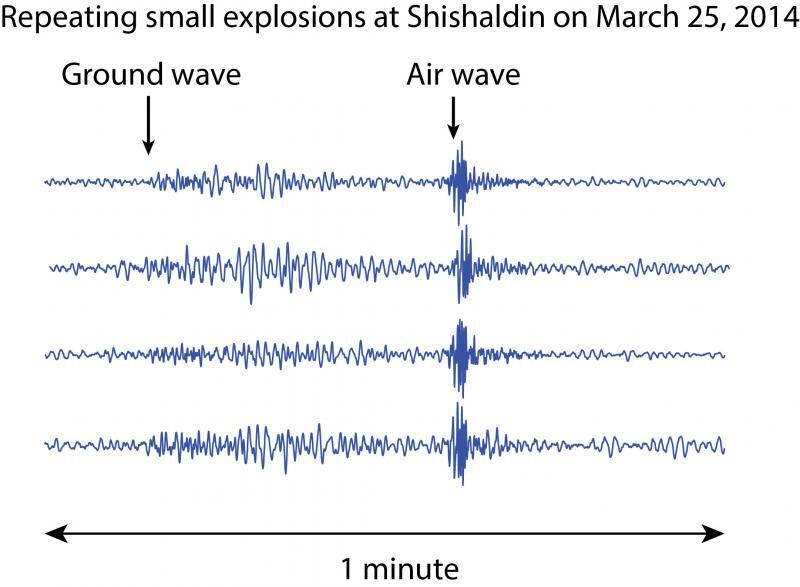 Over the past few weeks we've been seeing regular small explosions in the seismic record coming from Shishaldin's crater. Each explosion shows up as a low frequency seismic wave that travels through the ground, followed by a high frequency airwave pulse. The airwaves arrive later because energy from the explosion travels more slowly through the air than it does through the ground. While small explosions are often part of the background activity at Shishaldin, we haven't seen them showing up this clearly in the past 2 years. Elevated surface temperatures suggest there is fresh lava in the crater. Since the explosions were observed around the time that the lava was erupted into the crater, the two are probably closely related. We can't say whether the explosions are directly caused by the erupting lava, though, or whether they are just small puffs of gas coming from the crater floor.